Alfred Hitchcock warned us about kamikaze birds taking over our lives. Turns out that's not such a bad thing. You already own it. Maybe in more than one version. You’ve played it in elevators, bathroom stalls, meetings, and traffic. 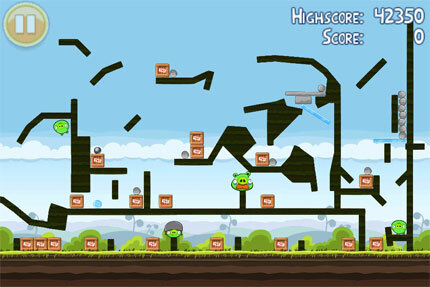 Long past the point of meme-dom, Angry Birds topped 300 million downloads in less than two years and is now available on every major mobile platform (as well as a host of desktop apps). As ubiquitous as a Mario brother, the birds have infiltrated nearly every facet of pop culture, with spin-offs from stuffed plush toys and pig-faced flip-flops to an upcoming feature film. There’s even a board game from Mattel. And they’ve evolved over time — the game now offers more levels, more characters of a different feather, and more structures to destroy. But the basic anatomy remains the same. The mechanics aren’t groundbreaking. Titles like Worms and Scorched Earth featured similarly cartoonish bomb-lobbing combat years ago. But the developer, Rovio Mobile, didn’t need to reinvent the wheel. Its genius was to combine simplicity and cutesiness with a physics engine that lends itself perfectly to touchscreen devices. The game also manages the rare trick of appealing to all age groups. Where more violent handheld shooters target 18- to 24-year-old males, Rovio’s “shooter” plays just as well with kids and adults. 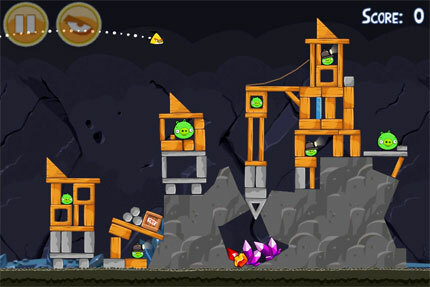 As unassuming as it seems, Angry Birds is an irresistible force. Globally, we log more than 200 million minutes of swine-sniping gameplay every day. We’re hooked.